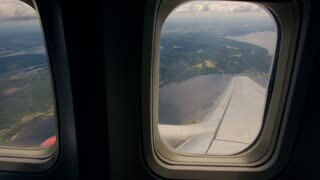 A view through the windows of an airplane in flight on approach to Oslo airport. Catching fish to eat diner at a lake in Norway. Footage of a map surrounded by passports, tourist guide, money, camera and sunglasses. 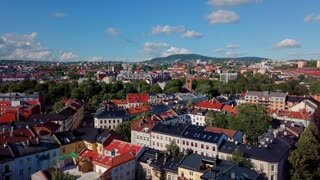 A hand is placing a pin in Oslo, the capitol of Norway and the camera zooms in at the location. Timelapse of many ships sailing aroud and cruise leaving pier. Oslo central alley with sun flare. Two people rowing boat in beutiful oslo canal. Deer statue with small child in Oslo center. Man skiing in sunset in Oslo, Norway.